In a segment unique to the North American Nintendo Direct, we had a brief look at some upcoming releases for the Wii U and 3DS eShop stores. Some details reiterated what we already knew, including release information for the concluding parts of Moon Chronicles and others, but there were some fresh games to take in. First up was Elliot Quest published by PlayEveryWare, an RPG adventure with five dungeons and 16 bosses, while also sporting rather attractive 2D pixel-based visuals; it's due in February. Also confirmed for a February arrival is Blek, a combined project by Broken Rules - which released Chasing Aurora as a Wii U eShop launch title - and kunabi brother, this is a simplistic and relaxing experience originally released on iOS; it looks like it'll utilise the GamePad touchscreen and potentially the Wii Remote pointer. Finally, Gunman Clive 2 was shown once again, this time with a January release. If that's the case then that will be a surprise treat this month. All of these release windows are for North America, though we'd hope that Europe won't be too far behind. Do any of these games appeal to you? I already knew of all of these games before the direct, nonetheless I'm happy they got the screentime. There are more indies that deserved the screen time as well though, I want another Indie Sizzle reel. I've not seen any of the regular Kickstarter articles for a while.Is that because there is nothing new to report or have I just missed them? Elliot Quest definitely caught my attention. I hadn't heard of it before, and the fact it will release so soon is awesome. Elliot looks like it could be amazing or could just be a run-of-the-mill indie game. I honestly can't tell. 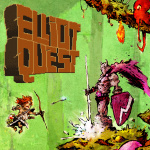 I feel like Elliot Quest would work better on the 3DS. Elliot Quest is a gem. Keep an eye on it! Gunman Clive stood out for me, great art style. Does Elliot Quest remind anyone else of Castlevania II: Simon's Quest? I must say I'm a little jelly about not getting Moon Chronicles here in the UK/EU. I literally came here just to say that. What are RK playing at? My c-stick needs an FPS.